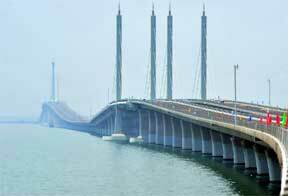 The Jiaozhou Bay bridge, which is the world's longest over-water bridge at 26.4 miles, opened in China. This bridge connects the port city of Qingdao to the suburban Huangdao on the other side of the bay. Cost figures for the Jiaozhou Bay bridge, which is expected to carry 30,000 cars a day, vary widely: State-run CCTV reported that the cost was more than 10 billion yuan ($1.5 billion) and the Xinhua news agency put the cost at $2.3 billion, and some estimates have put the cost at more than $8.8 billion. For that cost, the Jiaozhou Bay bridge is seriously sturdy. The Guinness Book of World Records announced that "the earthquake- and typhoon-proof bridge ... is designed to withstand the impact of a 300,000-ton vessel." The bridge has six lanes, is about 110 feet wide, and officials estimate that it will halve the journey from Qingdao to Huangdao to about 30 minutes. The Jiaozhou Bay bridge is the sixth longest bridge ever built, and breaks the record for world's longest over-water bridge by more than 2.5 miles, beating the United States' Lake Pontchartrain Causeway in Louisiana. Eleven of the world's 15 longest bridges are located in China. Guinness Book: The widest mouth on the planet. Scientists find way to cure diabetes? TV, Net, video via one cable! Climacon- a jacket that can keep you warm in the cold and cool in the heat. A robot to wash and dry your hair!